Yesterday I blogged about being in a "funk" lately. I greatly appreciate the support and kind words from all of you on here and on Twitter. It's encouraging to hear that I'm not alone in these feelings and that many of you have been there and are now on the other side. So this morning I went for a 1 mile walk with my wife and decided that I was going to finish it off with a short run. Just a time for me to reflect on my feelings and to get a little bit more of a workout. I adjusted the settings on my Garmin so that the only thing on the display was a stopwatch. This is how I ran when I first started...when it was fun. Sometime after getting my Garmin I got concerned with splits, distance, elevation and all of those other details that don't matter to me unless I'm racing or hoping to try for a PR. I ran with my iPhone in my SPIbelt, but kept MapMyRun turned off. I used to use it to autopost to Twitter that I started or finished a run. For the most part it was overkill, but in reality for me it was just another distraction that overtime took the fun out of running. The first two years my wife and I lived in Florida we lived in Clermont. It's about 20-30 minutes west of Orlando. While there we attended a phenomenal church called Real Life Christian Church. Just Miller is the pastor there...and every week he brought. I subscribe to the weekly sermons from there and listen to them whenever I have a chance. This week's was just what I needed. He talked about how we often live our lives trying to win the applause of other people. We strive for the approval of our peers, our employer, our parents and sometimes even our kids. It was definitely the reminder that I needed. That we're to worry more about His approval than the worlds. So it was a great run that was definitely needed. 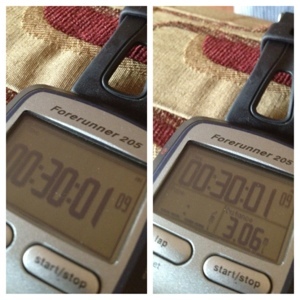 When I finished my 30 minute run I had hit the pace that I usually make as my goal pace for a nice smooth run. The nice thing about my Garmin is that I can have it just show the stopwatch during my run, but I can check my distance if I want after I finish. Way to "unplug" and just run! I've been doing that lately, too, and haven't really felt like running is a chore. And I totally agree with your reference to that sermon. I often times compare myself to other bloggers/runners/co-workers/friends, but need to step back and realize that none of that matters. His approval is definitely all that matters! I can't wait to hear "Well done, my good and faithful servant"!